Retail stockroom storage is becoming an ever greater challenge due to smaller stock rooms, faster picking rates and H&S legislations. Oracle Storage specialise in helping many of the leading retail houses by providing the ideal storage solution for them. From a few bays of shelving for the stockroom, a mezzanine floor in a retail outlet to pallet racking in a distribution centre, we can help. So if you're struggling with stock capacity contact us to organise a free site survey. 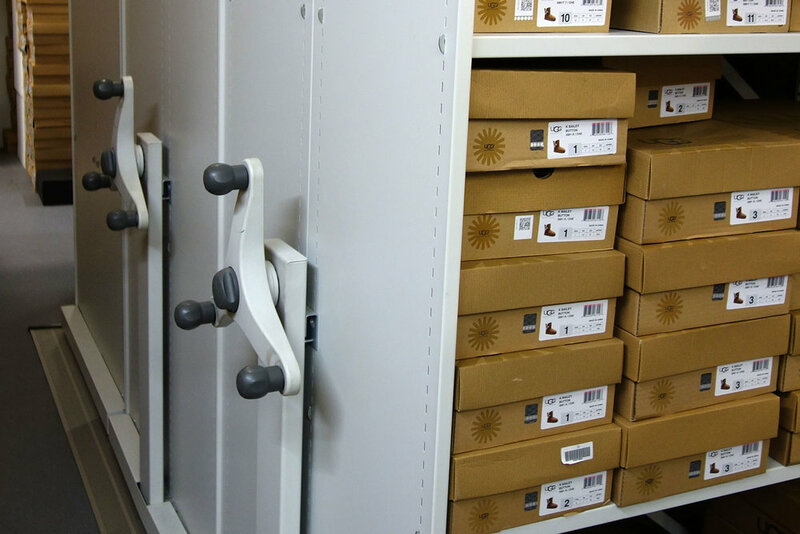 Ideal retail stock room mobile storage system to maximise space and still maintain H&S compliance. Stockroom design is essential, to achieve maximum stock density and our retail shelving & racking systems are ideally suited. We have storage systems for garment hanging, shoe & boot storage, lingerie, sports equipment, garment samples, pigeon hole shelving, stockroom workstations & more. We stock a wide range of shelving, racking and binning systems, for a quick delivery & installation. A common problem for retail spaces is lack of floor space, we can design & install mezzanine floors to free up shop floor space, extend the shop floor or to create additional storage space. We worked closely with a shop fitter on the above project to create a 2-tier mezzanine floor with an industrial look. This gave the client additional seating areas and storage space. We were tasked with planning the storage for Goodhood's new warehouse, the task was to maximise storage but still keep the environment nice for the workers. Being under railway arches with a curved roof meant each run of shelving needed to be different heights.